Summer is coming everyone. Finally, after weeks and weeks of waiting, the sun has decided to join the party. And with summer comes my daily craving for gelati. Gelati, shall I compare thee to a summer’s day? Though art more lovely and more temperate. Particularly in Melbourne, where we are notorious for having four seasons in one day, but since gelati is basically sunshine in a cup (or cone) it really makes everything ok.
Of course the most obvious place to find gelati is Melbourne’s own Little Italy, Lygon Street! Of course there are more than a few gelaterias up and down the high street, but you can’t go past Gelatissimo, with its huge piles of gelati and sorbet which is further piled with the fruits and chocolates, etc. used as flavours. Sure it is an international chain, but it is still pretty damn good. And there are many gluten and dairy free options. I know, I know, this is frozen yoghurt not gelati. But as far as frozen yoghurt goes this is pretty much top of the crop. Their yoghurt is pro-biotic, it uses natural flavours (unlike many other chains which use artifical flavours thus negating the goodness of the yoghurt) and the flavours they have are excellent. Green tea, pomegranate and coconut are all delicious choices and none of them are too sweet, which means when you are craving for ice-cream but have already had a whole cake earlier that day, you can feel a little less guilty! 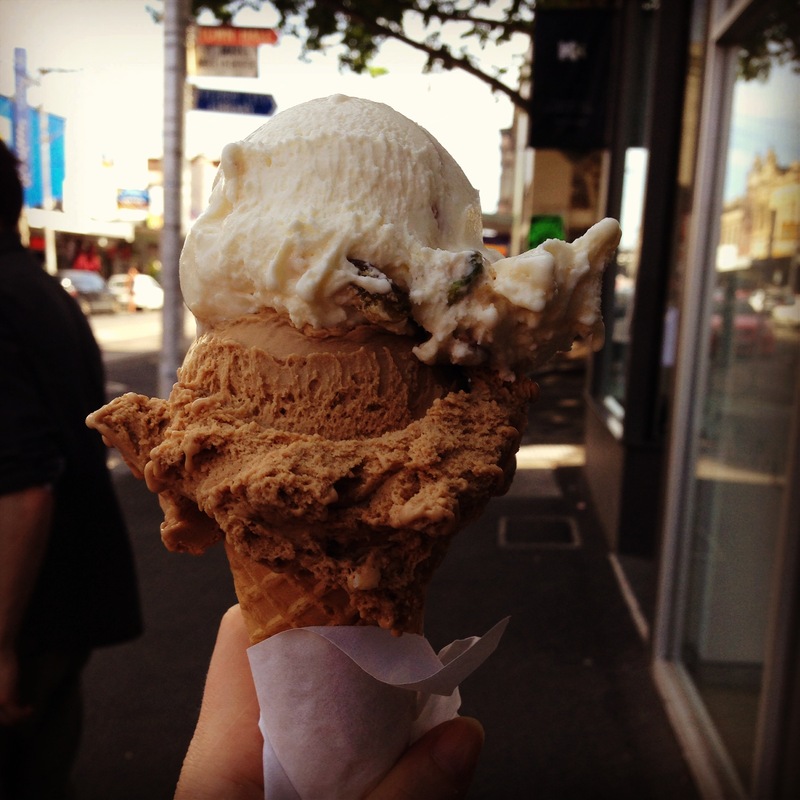 I first had their gelati at the Gelati Festival on Lygon street earlier this year. It was some sort of choc-hazelnut concoction with crunchy stuff in it and OH. MY. GOD. This gelati blew my mind. Like seriously. I would like to be buried in a vat of this stuff so I can eat my way out of it and then die very, very happy. Moonee Ponds is not the easiest place to get to, but if you can, you will not be disappointed. A Sydney based company with over ten years of experience, this place has exploded with popularity as their prestige was made official when they were chosen as the Good Food Guide’s Best Icecream in Australia. This means there is almost always a queue out the door. But this gelato is worth the wait! A huge range of flavours, with the standard chocolate and fruity combinations mixed with flavours like Pear and Rhubarb, Dulce de Leche and (my favourite) Pandan and Coconut sorbet, as well as a daily list of weird and wacky specials. I have even seen avocado flavour before, which they garnished with corn chips. All the great sorbets are also dairy-free. 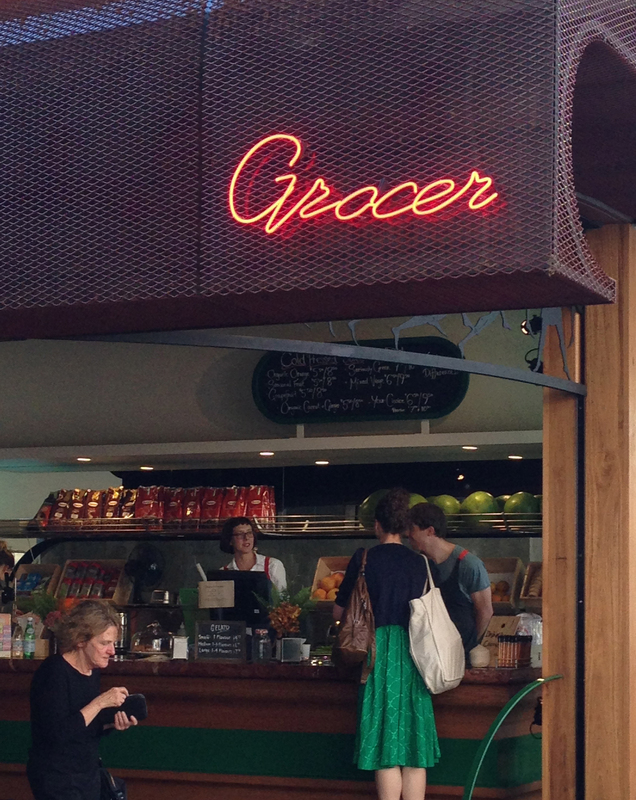 Nestled in the cool, foodie theatre district around Parliament, Spring Street Grocer is an Italian gourmet grocer out the back (hence the name) and out the front a purveyor of quick treats including excellent coffee, sandwiches, soups and, of course, gelati. Massimo Bidin has spent years studying and practicing the craft in Italy, the home of gelati. He specialises in the use of spices and unique flavour combinations to create taste explosions of icey ecstacy; from Salted Caramel and Chili to Tumeric, Cardamom and Pistachio. The sorbets certainly deserve a metion as well, try the delicious Watermelon and Mint or the Coconut and Ginger. They have a rotating menu so there is always some new flavour to discover, which always feature a few dairy-free/vegan options. AND they stay open until midnight everyday, perfect for a late night hit of sweetness! AND they let you taste before you buy. It’s little wonder this place is my favourite! Stay cool this summer, and stuff your face with gelati!